You Can Play Better Golf! Yes. You can play better golf. Believe it or not, the success starts by believing you can achieve something. That something may be a task, a career, or a game... including golf! Anyone can. Once you give yourself a chance by learning what to do and how to do it, you're on your way to success! The secret to playing golf, just like in anything else in life, consists of follwing a successful recipe. And just as there are many ways of baking a cake, there are many recipes to successful golf. This is one of many, but also one of the most successful golf recipes to date. You who score over 100 can break 100. The 90 golf player can get into the 80's. The high 80's can drop to the low 80's. And the low-80 man can break the barrier into the 70's. And don't tell us this is a gross exaggeration, already disproved by the frustrated millions who play golf. We assure you it is not an exaggeration. It has not been disproved. It is true. Of course, it'll take you far more than just reading this book and go out the next afternoon and knock ten strokes off your score! When we say anybody can play better golf, we mean "anybody who diligently applies him/herself to the principles laid down here, can cut a startling number of shots from his game". 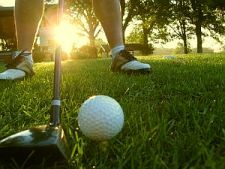 Setting aside the time to play golf from two to as much as four times a week. This price is not exorbitant. Sweat will be demanded, yes; but blood and tears are not involved. If you are willing to pay the price you will improve your game remarkably. You can play winning golf in your own handicap circle, and we don't care whether that circle is around 82 or 112. You can drop to a faster circle. Depending on your present altitude, you can cut from five to fifteen strokes from your score.